Listen to "Hunting El Chapo: The Inside Story of the American Lawman Who Captured the World's Most-Wanted Drug Lord" on your iOS and Android device. A blend of Manhunt, Killing Pablo, and Zero Dark Thirty, Andrew Hogan and Douglas Century’s sensational investigative high-tech thriller—soon to be a major motion picture from Sony—chronicles a riveting chapter in the twentieth-century drug wars: the exclusive inside story of the American lawman and his dangerous eight-year hunt that captured El Chapo—the world’s most wanted drug kingpin who evaded the law for more than a decade. Every generation has a larger-than-life criminal: Jesse James, Billy the Kid, John Dillinger, Al Capone, John Gotti, Pablo Escobar. But each of these notorious lawbreakers had a 'white hat' in pursuit: Wyatt Earp, Pat Garrett, Eliot Ness, Steve Murphy. 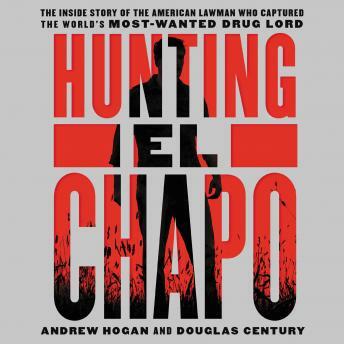 For notorious drug lord Joaquín Archivaldo Guzmán-Loera—El Chapo—that lawman is former Drug Enforcement Administration Special Agent Andrew Hogan. In 2006, fresh out of the D.E.A. Academy, Hogan heads west to Arizona where he immediately plunges into a series of gripping undercover adventures, all unknowingly placing him on the trail of Guzmán, the leader of the Sinaloa Cartel, a Forbes billionaire and Public Enemy No. 1 in the United States. Six years later, as head of the D.E.A.’s Sinaloa Cartel desk in Mexico City, Hogan finds his life and Chapo’s are ironically, on parallel paths: they’re both obsessed with the details. In a recasting of the classic American Western on the global stage, Hunting El Chapo takes us on Hogan’s quest to achieve the seemingly impossible, from infiltrating El Chapo’s inner circle to leading a white-knuckle manhunt with an elite brigade of trusted Mexican Marines—racing door-to-door through the cartel’s stronghold and ultimately bringing the elusive and murderous king-pin to justice. Great read! Just finished this riveting non-fiction book about how one American lawman strategically and effectively hunted down and captured one of the most notorious drug lords of the century. Wow. Take a front row seat to how it all went down. Reader-beware of the constant F-bombs ???? (which is why I found myself listening to this with headsets). Still, I was hooked. Sony has snagged the rights to this make this must-read a must-see Blockbuster. So stay tuned for that. You can also watch DEA agent Andrew Hogan on the latest Dateline for images and footage of his journey to capture “El Chapo”.